Blue Devils, Western Mass Cross Country Champions! Northfield- By winning the Western Massachusetts Championship last week at Northfield Mountain, the Northampton High School’s Cross Country Teams marked a huge milestone for the 2014 season. 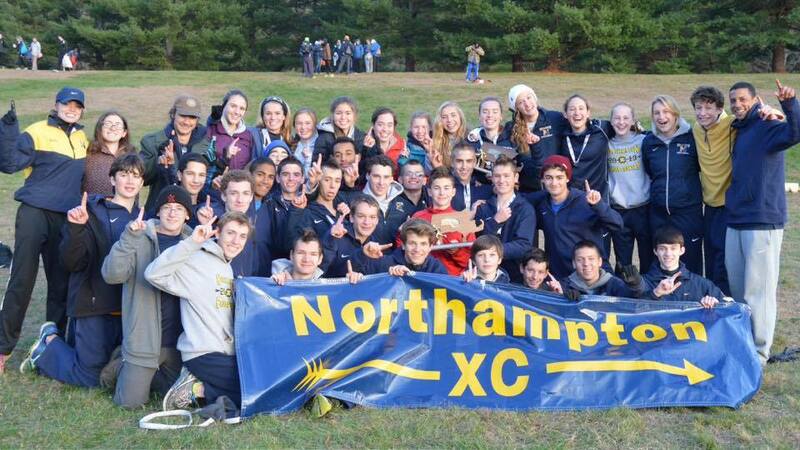 At the end of the 2014 regular cross country season, the Northampton Blue Devils came into the postseason with an undefeated record. The Blue Devils have had a longtime rivalry with Amherst Regional High School in Cross Country. However, Northampton recently defeated them to take the PVIACS title, coming in 1st place at the invitational. The last time the Blue Devils won the Western Massachusetts Championship was back in 2010, the same year they won the PVIACS. Junior Liam Sullivan came in first place with a time of 16:26 in the Division 1 Western Massachusetts Race. This places him as the fastest male cross country runner in Western Massachusetts. Sullivan was neck-and-neck with Amherst’s Conner Evans until the very end when Sullivan kicked in and beat Evans by 3 seconds. With only seven spots for each team, the NHS Men’s Blue Devils had the strongest team. Five of the seven spots came in the top 20 for the Western Massachusetts Championship: Aidan Gilson, Liam Sullivan, Ben Hill, Tim Foldy-Porto, Abe Herzog Arbeitman, Daniel Belkin, and Sam Norton. On November 15th, the team will be heading to the Massachusetts State Championship to face the top fifteen teams in the state of Massachusetts. 1st Liam Sullivan 16:26, 3rd Aidan Gilson 16:46, 4th Ben Hill 16:55, 7th Tim Foldy-Porto 17:14, 13th Abe Herzog-Arbeitman. Senior Mariel Lutz came in first place with a time of 19:59 in the Division 1 Western Massachusetts Race. The NHS Women’s Blue Devils had four runners in the top six. Mariel Lutz, Maggie Mahoney, Erica Dean, Stephanie Jordan, Tori LaVerdiere, Maddie Illingsworth, and Lauren Munster are all heading to the next challenge: the Massachusetts State Run. 1st Mariel Lutz 19:59 , 3rd Erica Dean 20:40, 5th Stephanie Jordan 20:51, 6th Maggie Mahoney 21:01. Junior Erica Dean came in third place overall, and hopes to set her personal record next season, and win first place. Dean said she plans “to go on at least 5-6 runs a week, I plan on doing swimming, and spring track and field during the year” to prepare for the next season.